Summer Student Poll: How to Stay Cool during Summer Session? 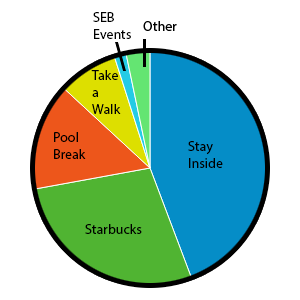 While everyone at UMBC is cool, we wanted to know how everyone stays cool during the summer in between classes. For Summer Session 2016, we hit the streets and began polling students (online and in-person), asking them, “How do you stay cool during Summer Session?” After all, Maryland is known for its hot and humid summers. We’re sweating just thinking about it. We received numerous great responses, but with 44% of the votes, the way our students prefer to stay cool is (Drum roll, please)……Staying Indoors! Okay, so it’s not an earth- shattering answer, but it does give you another excuse to take a summer course and escape the scorching sun inside the air-conditioned confines of a classroom. A few other popular answers included grabbing an iced coffee at Starbucks (27%), and taking a dip in the UMBC pool (14%). Summer Session pool party anyone? The RAC has great summer hours, and the RLC is a great place to chill and take advantage of the air conditioning. Did you agree with the answers? You too can participate in our next poll on our Summer Session myUMBC page or at our table on Commons Main Street. Come on over, say hi, and check out the amazing summer classes we have to offer (including a number of hybrid, online, GEP, and evening courses).